Feng Shui is very real and potent but a lot of people still think it is either a superstition, a joke or a waste of time! It's unfortunate that a lot of people are very ignorant about feng shui. In the case of feng shui, ignorance is certainly not bliss! During Joey Yap's Feng Shui & Astrology Seminar 2013, he said that the easiest way to prove that feng shui works is to put it to the test. End of story. Now we know that in feng shui, there are sectors or directions that are afflicted with bad energy. These afflicted directions, which change on an annual basis, are the Grand Duke (or Tai Sui), the 3 Killings, the Year Breaker and the 5 Yellow. The shaded areas in the above diagram show the afflicted areas. If you notice, each of the 8 compass directions is further subdivided into 3. For example, the East is subdivided into East 1, East 2 and East 3. This means there are a total of 24 directions which are known as the 24 Mountains. The Grand Duke is at South East 3, not South East 1 or South East 2. 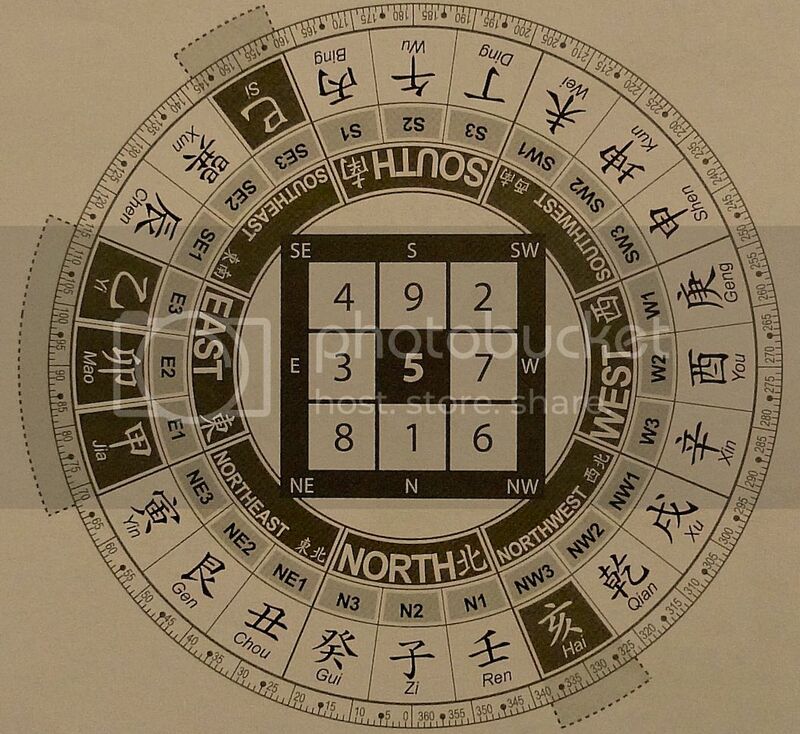 So you can see why in feng shui, the compass is a very important tool. You really want to get your direction as accurate as possible! To know the exact sectors in your house, just stand in the middle of your house and use a compass to get all the directions mapped out. For greater accuracy, superimpose the above diagram onto your house plan once you ascertained the North direction, and you will very quickly know which sectors in your house are afflicted in 2013. These afflicted areas MUST NOT be disturbed - that means NO renovation, knocking, digging, drilling a hole in the wall or groundbreaking as doing any one of them will trigger the bad stars resulting in misfortunes ranging from cashflow problem, accidents, and robbery to loss of wealth, illness, and medical complications! To the skeptics, you can try this test if you dare. This is also a test to prove to yourselves that feng shui is real and not some age-old superstition. The test is this - instead of leaving the afflicted areas in your house alone and undisturbed, you now purposely do some renovation, knocking, digging or groundbreaking there! So find the Grand Duke area (South East 3) in your house, and start doing some renovations there. Or find the 3 Killings area (East) and do some knocking there. Or start drilling the wall in the center of your house to trigger the 5 Yellow. Then see what happens. Of course you must agree to do this at your own risk and I shall not be held accountable should anything happen to you. Note : These afflicted directions officially come into effect on the 4th February 2013, so only perform the test on or after this date for best results! However, I also discovered at Joey Yap's Seminar that every year there are also 4 directions that contain favorable stars which can be activated in the same manner to bring positive outcomes. These 4 stars are the Sun, the Moon, the Dragon Virtue and the Fortune Virtue stars. Activating these 4 good directions is akin to acupuncture. Just like acupuncture where the needles are used to stimulate certain meridian points in your body, renovating or just moving your furnitures at these 4 spots help activate the energy points in your house. As you can see, it's all very simple. Trigger the bad stars and you get the bad effects. Activate the good stars and you get the beneficial effects! The Sun - this star helps to reduce the effect of you or someone accidentally activating your negative sectors. For example, if your neighbour did some renovation at your 3 Killings sector (either unintentionally because he knows nothing about feng shui or intentionally because he is jealous of you and wants to harm you!) then activating this star at South 2 this year will reduce the bad effects. The Moon - this star helps with communication problems and breakdowns. It is mostly useful in situations where miscommunications will cost you your job or just bring you lots of misery! Dragon Virtue - this star enhances your wealth luck and removes obstructions to your success. Obstructions in the form of people holding you back from climbing the corporate ladder or the bank not approving your loan can be solved by activating this star! Fortune Virtue - this star helps you achieve happiness and satisfaction, in other words better quality of life. Having lots of money may not bring happiness - it is really having no worries, having good health and being able to self-cultivate that brings happiness. Unfortunately, Joey Yap did not mention the time to activate these 4 stars. Or maybe I missed it. Or maybe you don't really need the exact time. I'm not quite sure. If anyone knows, please inform me. Thank you! Towards the end of the full day seminar, Joey Yap gave us a list of date and time to activate wealth, relationship, marriage, academic success, spiritual development, nobleman. He said that if one were to consult him for these dates, he would be charging RM3,800 (USD1,234) for each date! Wow! To activate the sectors, simply move the furniture around, clear up the clutter or play loud music. *Note : You can activate just one or all the 3 dates. The animals in brackets are those found in your Personal Bazi Chart, not just the animal sign you belong to. For example, if on the 25th Jan 2013, if you have a Rooster anywhere in your Bazi Chart, activating the South West 3 sector will not be beneficial to you, although it won't be harmful either. Thus, you will need to choose the second date or third date. *Note : Target here means your potential partner. To activate, you need to face the direction given and your intended target face the opposite direction. 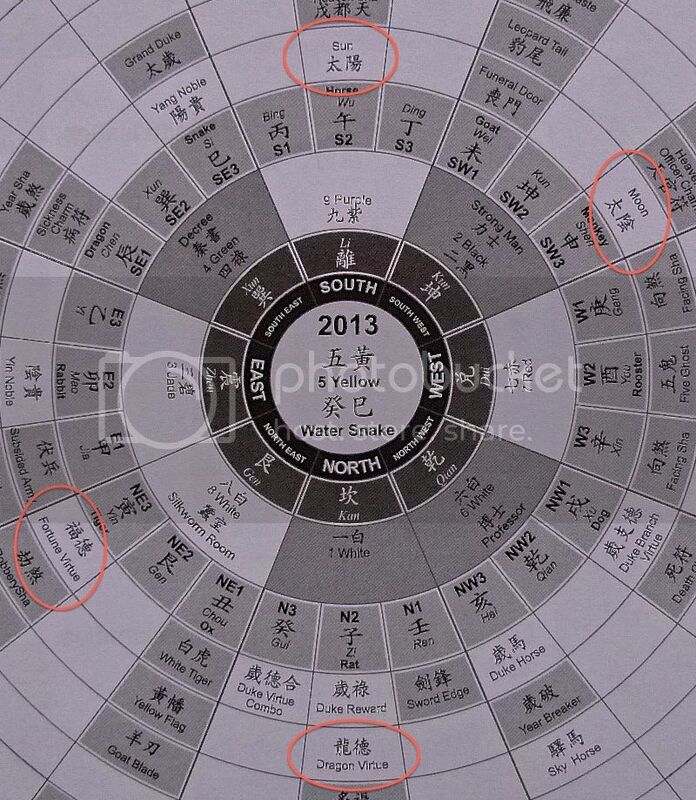 For example, to activate on the 19th Mar 2013, you need to face South East while your intended target face you ie. North West. And he or she must not have a Tiger in his or her Bazi Chart. So use a compass! And check his or her Bazi Chart beforehand! *Note: These are dates and times to resolve weight problem or issues with friends. If your aim is to lose weight, you need to make sure you have the animal mentioned in the bracket above in your Bazi Chart. But if your aim is OTHER THAN losing weight, then you must make sure you DO NOT have the animal in your Bazi Chart. For example, if you wish to lose weight then it is best to start on the 21st April 2013 at 11.30am and it is better if you have a Pig in your Bazi Chart. However, if you plan to resolve issues with friends on this date, then you MUST NOT have the Pig in your Bazi Chart. *Note : Academic success does not apply to just students but also working adults. You need to study or continuously learn to improve your value to your employer or business! For the 20th July 2013 date, you may have noticed that the direction is South East 3 which is the Grand Duke sector. Although we should not activate the Grand Duke sector, it is however OK to activate ONLY on this date and time. *Note : These are dates suitable for prayers and making your wishes come true. Joey termed it as a day where you have "broadband access" to God. Chinese New Year is coming soon and most Chinese who celebrate always welcome the God of Wealth into their homes every year to bring in wealth. According to Joey Yap, the God of Wealth is not really a god, but is actually a star in the sky. It is a wealth star and to activate it, you can do what most Chinese do every year - set off loud firecrackers! Joey provided the exact date and time to activate this God of Wealth star, which is on the 10th February 2013 (1st day of Chinese New Year) at 3.30am facing the West direction. If you cannot stay awake till 3.30am then you can also activate at the second best time, which is 12.30am on the same day. Joey also mentioned that if you open the door facing West at this date and time, you will be able to see the wealth star shining in the sky! The Chinese like to choose an auspicious day to start work after the Chinese New Year holidays. This particular day is important as starting work on the right day will have good implications for the rest of the year! *Note : The BEST DAY is Day 12 ie. 21st Feb 2013 but if you have Rat in your Bazi Chart, then you will have to choose the other days.